Harting’s ix Industrial range of Ethernet interfaces set a high standard for Ethernet interfaces and respond to the future challenges posed by Industry 4.0 and the IoT (Internet of Things). The interface is ideal for a variety of fields and applications including machinery and robotics, energy, automation, data networks and transportation. There has been recognition that device interfaces and system cables need to be smaller, more powerful and even more robust. 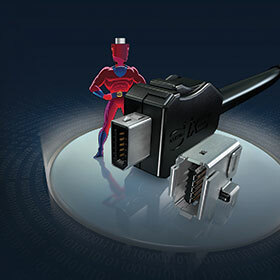 Therefore, Harting has worked in conjunction with Hirose to develop this new technology to deliver the robust ix Industrial miniature Ethernet interface, which has the potential to replace the conventional RJ45 connection. The unit takes up 70% less space than the RJ45 and is much safer because the two snap-in metal hooks ensure that the receptacle and connector are more securely connected. Data transmission is safe, even in EMC-critical applications, due to the continuous 360° shield design, which guarantees high immunity from interference. Robustness is provided by the receptacle, which has five though-hole shield contacts. These permanently and securely affix the socket to a PCB to prevent damage to the conductor tracks caused by the exertion of high forces on the sockets. Other features include a robust cable attachment, high resistance to shock and vibration, and ability to handle 5000 mating cycles. It is also designed to provide Cat 6A performance for 1/10 Gbps Ethernet and is standardised to IEC/PAS 61076-3-124.